Teacher beliefs play a fundamental role in the education landscape. Nevertheless, most educational researchers only allude to teacher beliefs as part of a study on other subjects. This book fills a necessary gap by identifying the importance of research on teacher beliefs and providing a comprehensive overview of the topic. It provides novices and experts alike a single volume with which to understand a complex research landscape. Including a review of the historical foundations of the field, this book identifies current research trends, and summarizes the current knowledge base regarding teachers’ specific beliefs about content, instruction, students, and learning. For its innumerable applications within the field, this handbook is a necessity for anyone interested in educational research. Chapter 1. Introduction. Section One. Foundations of Teachers’ Beliefs Research. Chapter 2. The Promises, Problems, and Prospects of Research on Teachers’ Beliefs. Chapter 3. 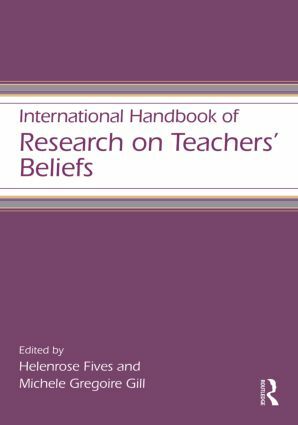 Historical Overview and Theoretical Perspectives of Research on Teachers’ Beliefs. Chapter 4. The Development of Teachers’ Beliefs. Chapter 5. The Relationship between Teachers’ Beliefs and Teachers’ Practices. Section Two. Studying Teachers’ Beliefs. Chapter 6. Assessing Teachers’ Beliefs: Challenges and Solutions. Chapter 7. Measuring Teachers’ Beliefs: For What Purpose? Chapter 8. Qualitative Approaches to Studying Teachers’ Beliefs. Chapter 9. Methods for Studying Beliefs: Teacher Writing, Scenarios, and Metaphor Analysis. Section Three. Teachers’ Identity, Motivation, and Affect. Chapter 10. The Intersection of Identity, Beliefs, and Politics in Conceptualizing ‘Teacher Identity’. Chapter 11. A Motivational Analysis of Teacher Beliefs. Chapter 12. The Career Development of Preservice and Inservice Teachers: Why Teachers’ Self-Efficacy Beliefs Matter. Chapter 13. A “Hot” Mess: Unpacking the Relation between Teachers’ Beliefs and Emotions. Section Four. Contexts and Teachers’ Beliefs. Chapter 14. Teachers’ Beliefs about Teaching (and Learning). Chapter 15. Teachers’ Instructional Beliefs and the Classroom Climate: Connections and Conundrums. Chapter 16. Teachers’ Beliefs about Assessment. Chapter 17. Context Matters: The Influence of Collective Beliefs and Shared Norms. Section 5. Teachers’ Beliefs about Knowing and Teaching within Academic Domains. Chapter 18. Personal Epistemologies and Teaching. Chapter 19. The Individual, the Context and Practice: A Review of the Research on Teachers’ Beliefs Related to Mathematics. Chapter 20. Beliefs about Reading, Text, and Learning from Text. Chapter 21. Science Teachers’ Beliefs: Perceptions of Efficacy and the Nature of Scientific Knowledge and Knowing. Chapter 22. Teachers’ Beliefs about Social Studies. Chapter 23. Teacher Beliefs and Uses of Technology to Support 21st Century Teaching and Learning. Section Six. Teachers’ Beliefs about Learners. Chapter 24. Preschool Teachers’ Ideas about How Children Learn Best: An Examination of Beliefs about the Principles of Developmentally Appropriate Practice. Chapter 25. Teachers’ Beliefs about Cultural Diversity: Problems and Possibilities. Chapter 26. Teachers’ Beliefs about English Language Learners. Chapter 27. Teachers’ Beliefs about Students with Special Needs and Inclusion. Helenrose Fives, Ph. D. is an Associate Professor of Educational Psychology and Teacher Education at Montclair State University in New Jersey. Michele Gregoire Gill, Ph.D. is an Associate Professor of Educational Psychology at the University of Central Florida.